Amazon quickly dominated the online shopping market by providing users and businesses a platform to buy and sell products. Its usability, service, quick/free deliveries and options to compare a vast array of products made this the go to site when shopping for items. You can probably source most things through Amazon rather than scouring the internet for hours, and over the years this online shopping site has become a quick habit to fit in with our fast paced lifestyles. Amazon has millions of sellers that even include the high end brands that do not want to avoid missing out on opportunities but here at Caribbean Blinds, like many other companies out there, you will not find us on Amazon. Why you ask? Our External Blinds, Patio Awnings and Louvered Roofs are the finest in Britain, they are constructed with robust materials using state-of-the-art machinery to ensure the consistency in the quality. For over 30 years we have been manufacturing bespoke external shading solutions in the United Kingdom and we uphold our brand value of quality assured products and offer a direct and informative service. 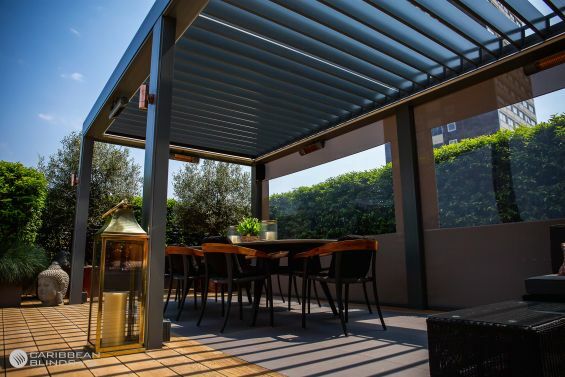 There are many benefits to external shading solutions and without that client interaction we would be limiting their knowledge which will mean they may be missing out. By offering our superior external window blinds, garden awnings and louvered pergolas on Amazon we are taking away our relationship with our clients and not providing them with the full service, from enquiry to design and finally installation. These shading applications help to enhance lifestyles and without client communication we are unable to understand the client’s needs and we will not be able to fulfil our goals to the best of our abilities. So come and talk to us and discuss your project, we will put you in contact with one of our knowledgeable and dedicated advisers to give you the information you need to make a decision – 0344 800 1947 or alternatively you can use our quick enquiry form to receive our FREE detailed brochure.